Indian filmmaker Aditya Chopra has announced that after 7 years, he is going back behind the camera and will be directing a film titled 'Befikre'. The exciting announcement was revealed on Yash Chopra's 83rd birth anniversary. On Sunday (September 26), Aditya shared an emotional imaginary conversation with his father, his 'go-to guy,' Late Yash Chopra. The imaginary conversation ended with, "So with the blessings of my father, on his 83rd birth anniversary, I am announcing my next directorial venture after seven years. Befikre - Those who dare to love." Aditya, who last directed 'Rab Ne Bana Di Jodi' in 2008, admits in the letter that his father always wanted him to direct the 'biggest films of YRF' and this new project is 'not that'. He has also cleared that 'Befikre' will not be made to chase numbers or break the box office records. Yash Raj Films are known for big names and big budgeted films but this project is just for fun of making a film and love for art. The film may not be that successful as YRF's earlier films including Dilwale Dulhania Le Jayenge and Mohabbatein - but Aditya has admitted that he absolutely loves it. 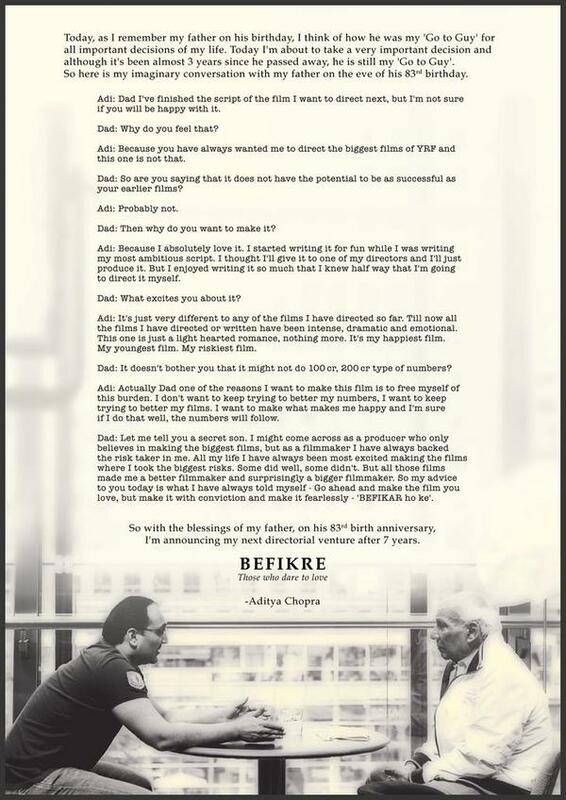 In the letter, Aditya has described Befikre as a light-hearted romance; his happiest movie; his youngest, riskiest film yet. The film's tagline reads - 'Those who dare to love', indicating that love will be a core element in Aditya's new film.